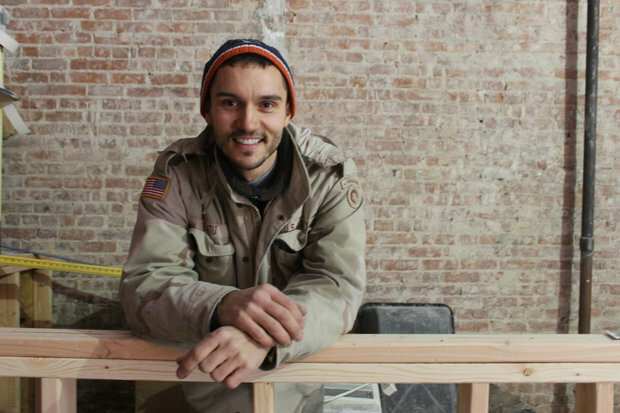 HARLEM — Bartender turned contractor Claud Fatu has spent the last eight years pouring drinks and renovating businesses for other people. Now he's doing it for himself. Fatu, an Army veteran who started his own construction company soon after being laid off from bank of America during the 2008 financial crisis, has been crafting the bar Harlem Nights at 138th Street and Adam Clayton Powell Boulevard — one detail at a time. Outside, the place will look like a cabin that you’d find in Maine or the Swiss Alps, he said. There will be large vertical pieces of cedar on the walls, a wooden roof that replaces the awning and small wooden benches by the windows. The watering hole will feature a mix of craft beers and unique drinks, he said. Inside, the bar will be filled with cool features including phone chargers built into the walls and a small stage for a baby grand piano that local musicians can use to perform. Fatu has also ripped through layers of walls and floors to expose the building’s original brick walls and white tile floors. Although the bar isn’t set to open for several months — Fatu hopes to be ready by Memorial Day — it already has a client base. Fatu, who previously lived in the East Village, moved to Harlem last year, right across the street from where the bar will open. He said he was drawn to the area because it still feels like a neighborhood, the sidewalks are filled with big crowds and people say hello when you walk down the street, he said. Locals said they're looking forward to the opening. Harlem local Shaheed Thompson, who didn’t know the place is going to be a bar, was excited when he learned the news.